That is the rallying cry and that is the spirit in Yonge-Dundas Square at this moment, as Torontonians gather to show their support for freedom demonstrations—the ones which successfully brought down Tunisia’s leadership, and the ones which seem poised to usher in a new era in Egypt as well. With cries of “Go Mubarak go go / Let the tree of freedom grow,” the crowd is a mix of defiant, hopeful, and anxious, with many concerned for the welfare of friends and family in Egypt. One protester we spoke with, Moutaz Emara, moved here from Egypt a year and a half ago; President Hosni Mubarak has been running the country since before Emara was born. Emara’s biggest concerns are the poverty that burdens so many Egyptians, and the fear that has so long kept them silent. Until this week, he told us, nobody he knew would have publicly criticized the government. “They get taken from their homes, they get tortured,” he said of those who speak out. He spoke with several friends in Egypt by phone before the lines were cut off; they were staying home to protect their families from the looters who have started roaming in some places. Abdel Selsel said he came to support Egyptian youth and to raise awareness of their cause. 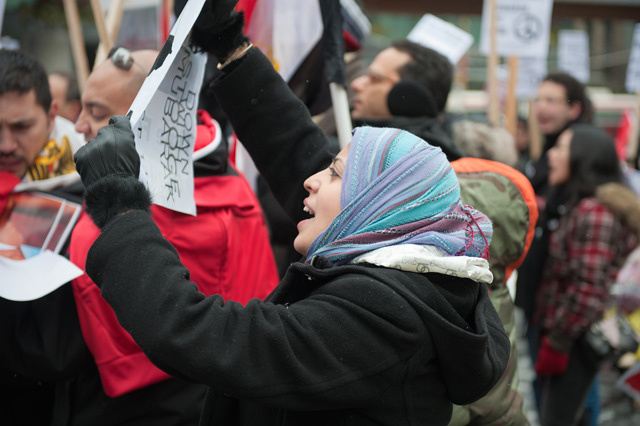 An Egyptian who has been in Canada for ten years, he remembers Mubarak’s Egypt as a place where a privileged class of people close to the Mubarak family enjoyed their lives, while the rest of the country couldn’t fulfiill its daily needs and lacked political freedom. He believes the president has been able to stay in power so long by simultaneously convincing the West that granting political freedom would lead to the rise of the Muslim Brotherhood (thereby creating chaos in the region), while telling Egyptians their problems are the fault of the West and that he is their best protector. At some point in the afternoon, another rally calling for revolution in Iran started across the street from the Egyptian-Tunisian one in Yonge-Dundas Square. “Egyptian” endorsed their cause too, and expressed hope that recent events could start a chain of democratic revolutions across the Middle East. And in fact, one of the most striking features of today’s rally is this sense of mutual support, a feeling of solidarity between the people of different countries. Today, many Torontonians are standing with them. Al Jazeera English has live-streaming coverage of events as they unfold in Egypt. Reported and written by Hamutal Dotan and David Olsen.